AN IPSWICH business breaking new ground in the aviation industry is preparing to take its landmark product to the nation's largest air show. Nestled in a small shed at Ipswich Business Park, Geosim Technologies has grown rapidly in the past few years. 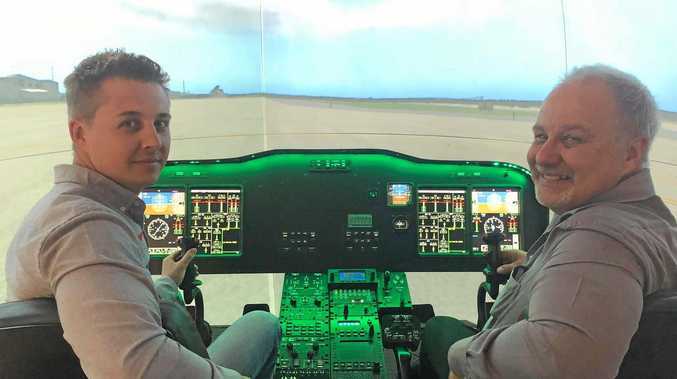 It is a small company creating flight simulators for a range of aircraft. Managing director Charles du Plessis and his team will travel to Victoria for this weekend's Avalon Air Show. "We've got a fair amount happening at the moment,” he said. Ipswich City Council's Office of Economic Development will coordinate the City of Ipswich Business Mission to take part in the expo at the Avalon Air Show. Great Springfield Chamber of Commerce president Neil Coupland said by highlighting what Ipswich could offer, the region could work collaboratively with defence partners and secure new business and industry. Mr du Plessis said Ipswich would take significant aviation industry experience to Avalon. "People ask can anything good come out of Ipswich; well I say there's a heck of a lot of good coming from Ipswich,” he said. Geosim Technologies has secured the contract to provide flying simulators to New South Wales' Westpac Life Saver Rescue Helicopter Service. It has two more flying simulators with one going to Turkmenistan and one to United States. Mr du Plessis said the company was finishing off its 139 simulator for Westpac "and there's a number of other contracts”. "We are up to our eyeballs in work,” he said. "We're at an interesting time when we're too small to be a big business and too big to be a small business.